Creative Stencil Projects We Love! Home Accent wall stencil ideas Creative Stencil Projects We Love! We are going to start off this fan feature with a pretty stenciled accent wall. 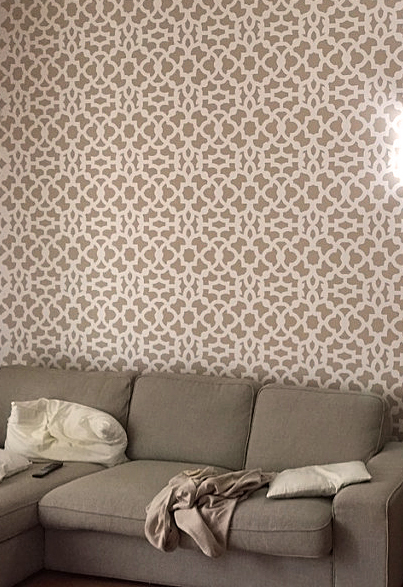 Ivie, a creative fan, painted the Zamira Allover Stencil pattern in creamy white over a soothing gray colored wall. She commented, “I love my accent wall stenciled with the Zamira Stencil. Even my friends and relatives noticed and gave lots of compliments. Erika, in Customer Service, was also very helpful and assisted with all my queries. Thanks so much!” We think her accent wall is stunning! The oh-so talented Tania Christenson from Christenson Designs showed off her stenciling skills with this scene stealer of an accent wall. She painted the Zamira Allover Stencil in Tiffany-box blue and white in a Client’s bedroom. The sophisticated color combination and Moroccan wall pattern create the perfect backdrop of elegance for this space! Stencils sure have a way of perking up an old piece of furniture! Anne emailed us pictures of her project saying, “I spent a lot of time looking for THE perfect stencil for my plain Jane dresser. 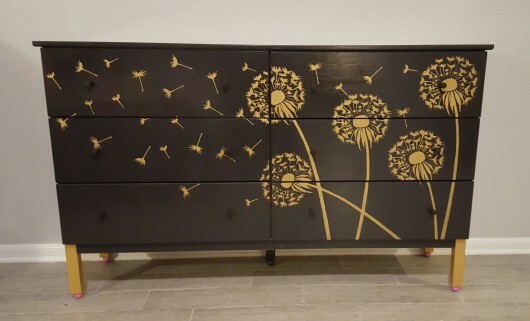 The Dandelion Stencil was exactly what I was looking for and this dresser isn’t plain any more!” We think this stenciled dresser is amazing, Anne! 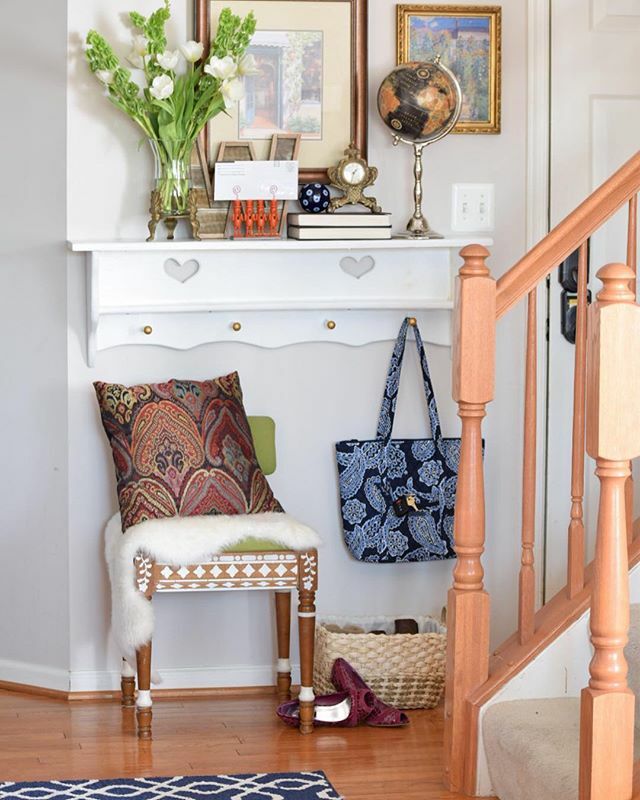 Stephanie (casawatkins) snapped a pic of her eye-catching entryway. She commented, “Sometimes the smallest of spaces can make a big impact. I’m making my way around the house organizing and decorating. First stop, the garage entryway! ” This welcoming space greets guests with a painted chair featuring our Indian Inlay Stencil Kit. We love it! Sarah M., a facebook fan, shared this beautiful bedroom. She said, “I’m almost done with an accent wall in my master bedroom, courtesy of your fabulous stencils. I’m amazed by the quality of your product, and will happily recommend it to others! 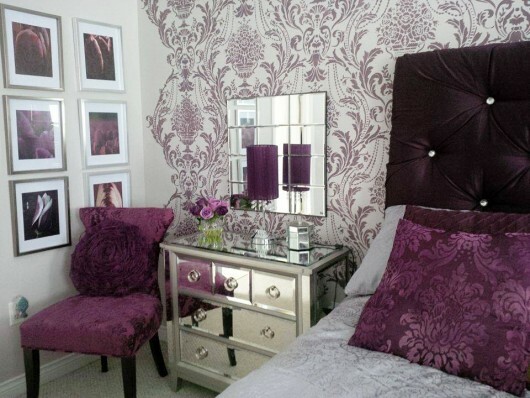 Thank you so much!” She painted the elegant Anastasia Damask Stencil in plum over a white accent wall. Oh, and then we can’t forget this stunning project. 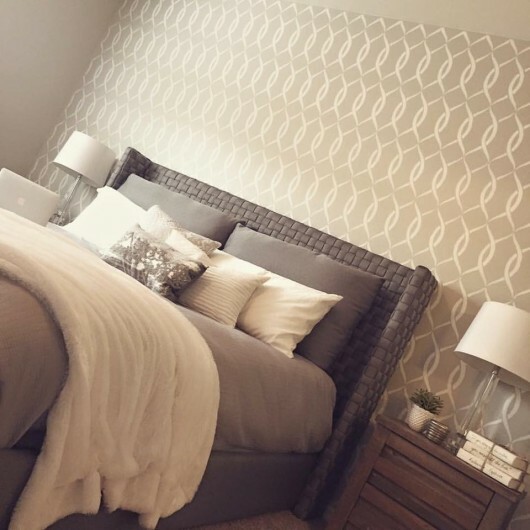 StettieHand shared this stenciled bedroom featuring our Entwined Allover Stencil. She said, “Love how this room turned out. The white geometric stencil is stunning. ” Peaceful and pretty is how we would sum it up! We want you to continue to share these inspiring projects so if you have a stencil project that you’d like us to see, please submit it on our website here or upload it to our Facebook page or use the hashtags #cuttingedgestencils on Instagram. Which one of these stenciled projects is your favorite? Leave us your thoughts in the comments below! Buy a stencil and update your space today! Have you completed a stencil project recently? Come share it on Facebook! We love seeing our fans’ stencil projects!